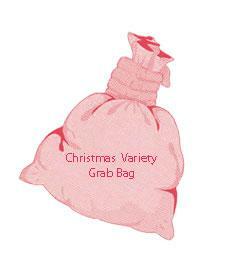 Every Grab Bag contains lots of beautiful linens, velvet and non-woven items to paint all with a festive theme. Plus a Wall-hanging, or assorted gift tags, tree-decorations, festive samplers or festive bookmarks to give as a gift with your Christmas cards. Total value over $110 worth of items to paint in every Grab Bag! MEGA VALUE!